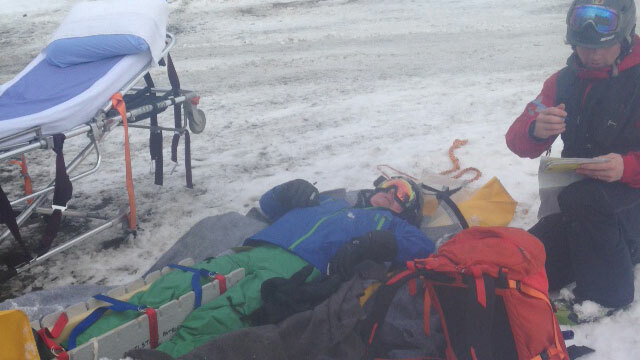 Australian skier Kieran Kelly awaits transfer to hospital at Revelstoke, British Columbia, Canada. On January 19, 2015, in the first couple of hours of a planned, one-month, skiing holiday, I smashed my tibia after skiing into a hole. What followed was a journey through the medical systems of three countries, numerous expert medical opinions, surgery requiring a plate and screws and a long period of rehabilitation. The latter I’m still enduring. During this process I’ve learned much about the reality of skiing injuries, about doctors and medicine and about pain and trauma. I’ve learned about how we cope as we age and how suffering affects us mentally. Sadly, I’ve also learned that in this information age, there is no one place where a patient can access advice on the various aspects of surgery and treatment, including skeletal, lymphatic, soft tissue and venous implications. Moreover, there is no timeline that an injured sportsperson can go to check on the progress of their recovery. To overcome this deficiency I have started this site which is dedicated entirely to the implications of tibial plateau fracture, surgery and rehabilitation. It is aimed at people 50+ but much will apply to those who are younger. Hey mate. I’m impressed with your blog. It’s got some great info. As far as helping you goes, it was my pleasure (except for emptying the pee bottle that is…) As for you being in my debt, that’s what family does, and I would do it again in a heartbeat. replacements didn’t enjoy the trip(result of skiing injuries back in ’64) Good luck with your amazing rehab& will try & find your latest trip. Thx for your interest. Flinders Ranges are on the still to do list. I had a mountain bike accident on the 25th of February 2016. I broke both my legs including Tibial Plateau in both legs. Right leg 26, left 14. I spent 9 weeks in North Shore, having Dr Ruff as my surgeon. I love my mountain biking and travel all over the world to do so. I have just started stationary bike this week. Trying to get some information, I came across your experience. Was helpful getting information from someone who has experienced it. I have also set goals as well, and hope I have not set the bar to high. I was sorry to hear about your accident. Gee and I thought I had problems. One leg is bad enough; to must be cause for righteous anger. I didn’t understand your classification of “right leg 26 and left leg 14.” Is that some sort of fracture classification? 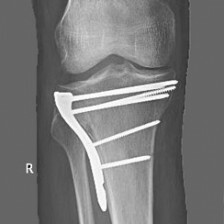 Usually they go off a Schatzker classification I to VI for tibial plateau fracture. I had about a II which is fairly typical for a skiing accident. If you were injured in February and spent nine weeks in hospital (wow!) you were probably weight-bearing in early June which means you are only now beginning rehabilitation. I started stationary bike in about week seven post-operative, which was the first week weight-bearing. I think stationary bike is an excellent way of starting to get range and motion back in your knee and the first steps in getting some strength back. It can be tedious but you just have to stick with it. About a month ago I was recommended to begin road biking again. This is also very good for muscle recovery takes a while to get confident. If it’s any consolation, I have made a full recovery for all mundane activities such as walking, swimming and bike riding. For these types of exercises I do not have any discernible symptoms of the fracture or surgery. Skiing is another matter. I was very disappointed over the Australian summer at the amount of pain I enjoyed while skiing in the United States. That was 12 months post my accident and I had worked very hard and expected more. Nevertheless, I’m now in my second year and the rehab continues and I hope to be able to ski again during the northern winter 2017 season. Good luck in your recovery. Please post on this blog if you want any further information. I had 26 fractures in right leg and 14 in left. I have been able now this week to do 3 cycle sessions at the cycle lab and keep within set zones and also wear my cleats. Great to see progress, but I find it so hard to get on and off the bike,to the point that the instructor has to help me.So stationary bike is my only option at the moment. I have had my bikes fully serviced this week in anticipation on getting back on a real bike. I would be happy with a cycle path or dirt road at the moment. My physio and surgeon say I am miles ahead but I find getting the next level of ROM is so hard. I am meant to be in Rotorua in late October, for 2 weeks of mountain biking, so using this as a goal. In the back of my mind this may not be achievable, but hoping so, as I had to cancel my Park City trip for last month. Hope your shredding the slopes soon. Thank you for making contact and for reading my blog. I hope you find it helpful. 26 fractures in one leg and 14 in the other is obviously a lot worse than my skiing accident. That is more like the injuries sustained in a car accident. Hard to believe it happened just off a mountain bike. You must have been terribly unlucky. I hope you have not had too much pain. I also had to be helped on and off the stationary bike the first couple of times I tried it so don’t get too worried about that. If you are managing to get in and out of cleats you are doing very well as I wasn’t even game to try this for about 12 months after surgery. It took me about 15 months to get on a road bike and I have been taking it very steady, just going around flat areas in Manly and up to North Head. I have started with a new personal trainer who is a very good cyclist and he has got me doing a lot of sprints in the gym and wants me to start spin cycle classes. I’m now about 18 months out since surgery and I have still not made a full recovery, although I can do most things comfortably except running and skiing. My principal goal is to be able to ski at the same level I did before. Whether I achieve it or not only time will tell. The PT says there is no reason why I couldn’t take up serious road cycling, particularly as I am in the process of retiring. He said it would be very good for my knee. In fact he believes cycling is the best rehab of all four tibial plateau fracture. Anyway good luck. Let me know how you get on. PS the cold snap in Manly at the moment is not helping either. You should try it in the ocean if you think the air is cold. I didn’t realise you lived in Manly. We might bump into each other some time limping around. If it the water is not bath temperature, you will not see me in it. I fell 2 stories off a jump, which is why I was not so lucky, but also very lucky. The surgeon was sure I must have crashed a motor cross bike when he saw the injuries. Born in Manly Hospital, and never moved much further.I hope to bump into you one day. Will give you a call. Minus the swim.